ArtDmx Sender --- Broadcasts a structure of DMX values to the specified IP Network, Sub-Net, and Universe. ArtDmx Receiver --- Receives broadcast DMX values from the specified Sub-Net and Universe. Both patches work with either raw DMX values (ranging from 0 to 511) or normalized values (fractional, ranging from 0.0 to 1.0), depending on whether the "Normalized Values" checkbox is set. To set up your network accordingly, do this: System Preferences > Network > + (bottom left corner) > Ethernet (name it something like "Art-Net") > Create. Change "Configure IPv4" to "Manually", and set an unused 10.*.*. * IP address and subnet mask 255.0.0.0. No router. Click Apply, and restart Quartz Composer. If none of your computer's network interfaces are set accordingly, Art-Net packets will not be sent. The Channel Structure input is a keyed structure --- the structure's key represents the output ArtDmx channel (1 to 512), and the structure's value represents the value to send to that channel (0 to 255). You can also specify comma-delimited keys, representing a 16bit composite channel consisting of two arbitrary 8bit channels. For example, you could specify a key of "42,79" --- "42" is the channel to which the HSB is sent, and "79" is the channel to which the LSB is sent. The ArtDmx Sender patch has the option to send Short Frames. When enabled, complete DMX512 frames will be sent at start and every 4 seconds, and short frames will be sent in the interim. This is more efficient, but may be incompatible with some hardware. When disabled, complete DMX512 frames will always be sent. When receiving ArtDmx packets, the Sequence and Physical fields are ignored. 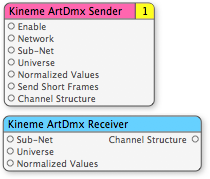 The ArtDmx Receiver only recognizes ArtDmx packets. Other Art-Net packet types are ignored.